Vegetarians have never had it so good: a wealth of new vegetable types, skilled and inventive cooks delivering dishes from cuisines unknown to our parents’ generation, and new kitchen technologies that deliver freshness and flavour inconceivable to the age of cast-iron ranges and steaming boiling-pots. So, while today a vegetarian can eat a light, exciting, fully flavoured and satisfying meal which may be the envy of many a carnivore, everyone will admit that the fate of a vegetarian or food-reformer in the reign of Queen Victoria was possibly not so blessed. 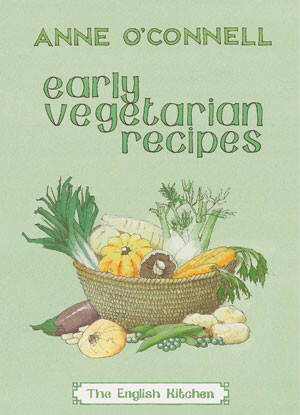 This little book explores the recipes that were developed by, and available to, the vegetarians of yesteryear. We will not pretend, nor does the author, that every recipe is a culinary thrill but each does unlock a certain secret about early vegetarianism, a movement that was of much greater significance in the years before the First World War than we sometimes acknowledge. The literature of vegetarian cookery starts with Thomas Tryon’s 1690 Wisdoms Dictates but then is virtual blank until the second half of the nineteenth century when vegetarianism became more widespread. This book offers a selection of recipes culled from manuals dating broadly from 1856 to 1908. The author does not explore the non-meat based recipes of some 18th-century books, nor the dietary suggestions of 18th-century physicians who were sometimes in favour of a less meat-based cuisine. Rather, she concentrates on the food-reformers of the late 19th century and the early 20th. It is arranged in logical chapters covering Soups; Salads; Beans, Lentils and Rice; Cheese and Egg Dishes; Cutlets, Croquettes and Sausages; Moulds and Galantines; Pies and Pastries; Vegetable Dishes; Sauces; Bread; Sweets; Porridge, Gruel, etc. ; and closing with menus for banquets and celebrations including Christmas Dinner. The recipes are offered in their original form with a minimum of editorial suggestion as to how they may be achieved. Clearly, the cooking was not very complicated. This book will be of interest to those curious about the history of vegetarianism. Those with longer memories will recall that vegetarian cooking, for instance after the Second World War, was surprisingly tasty and adventurous (they could work miracles with a nut cutlet). This book will give some hint as to how they achieved their ends. Anne O’Connell is a writer and film maker, who also trained in radio production with RTE in Dublin. Currently she is directing and editing documentaries and producing podcasts. She writes about food and travel and this is her first book. She lives in London.